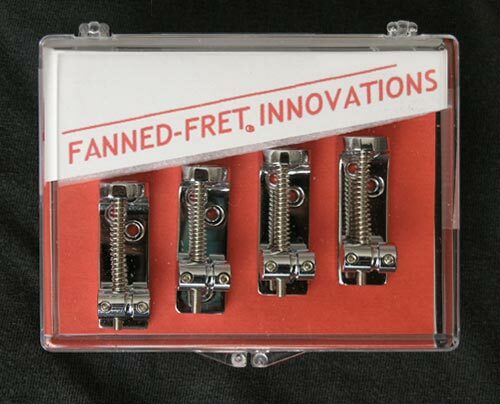 Fanned-Fret Innovations, a proprietary bass bridge design by Ralph Novak. 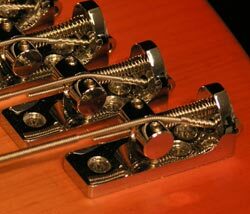 These solid brass bass bridges, available in Chrome or Black finish, recall the classic "three point suspension" and top-stringing design features, adding the versatility of individual bridge design and compatibility with GraphTech "StringSaver" saddles. The elimination of the massive "blocks" of metal that define most bass bridge designs give the player a tone that is clear, defined, and lively. Mounting screws are included. They will accommodate a 5/8" (16mm) string-to-string spacing.